Two 14 inch torpedo tubes were mounted, one on each side. These could be trained about 30 degrees forward or aft of the beam, as instructed by the torpedo officer at the sights on the flying deck. The torpedoes were fired by injecting compressed air from cylinders on top of the tube into the void at the back of the tube. In 1886, a typical Whitehead RL Mk VI 14 inch torpedo had a range of 600 yards at a speed of 25 knots per hour[*], with a warhead comprising 60 lbs of wet guncotton. The torpedo tube could be pivoted about a hinge at the front to allow it to be stowed against the armoured side when not in use, or when reloading. Colossus's torpedo tubed were located above the waterline. Later Royal Navy battleships generally had underwater torpedo tubes. Torpedo bodies were stowed in a compartment inset into the starboard forward coal bunker, where they were well protected by the main armour belt. 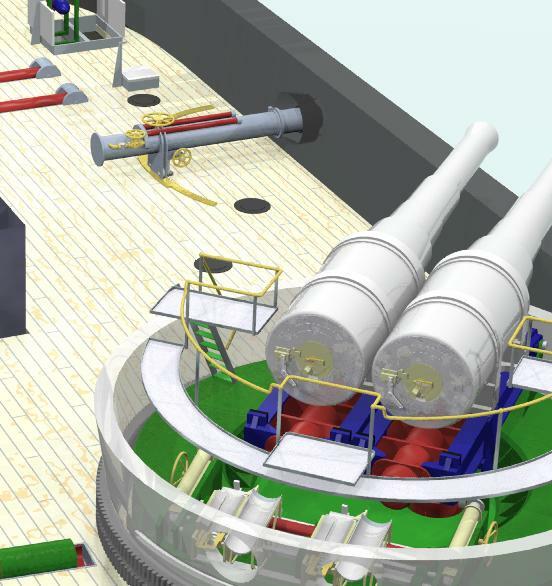 There appears there was space for 9 of the 14 inch Whitehead torpedoes. 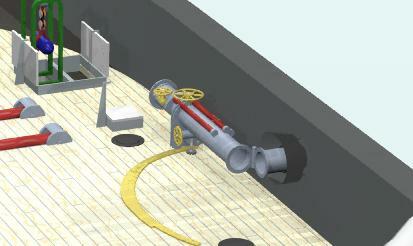 Warheads were kept in a magazine adjacent to the starboard forward shell room and would be supplied to the gun deck using the ammunition hoist. [*] In the 1880s and 1890s the term 'Knot' was a unit of distance equal to 1 nautical mile. Charts might show distances, for example between coaling stations, as a number of knots, and the endurance of a ship could likewise be expressed as a number of knots. Speed, therefore, is expressed in Knots per Hour. However, during this period, it was also common to shorten Knots per Hour to simply Knots, and it was left to the context of use to determine whether it referred to a distance or speed. In the 20th Century, Knots invariably meant a speed in nautical miles per hour.